Morrisey Video Production is now offering commercial drone services to Portland, Salem, Eugene, and throughout the entire State of Oregon. As longtime drone pilots, we are excited to announce that we have been cleared by the FAA to offer commercial drone services. These services include aerial photography, aerial videos, cell phone tower inspection, real estate video, real estate photography, aerial inspections, aerial golf course tours, and more. Over the years we have built a reputation as expert drone pilots through the independent film circuit. As well as creating several popular scenic videos from around the State of Oregon and throughout the Pacific Northwest. Our passion is to create push the limit of what’s possible to create breathtaking aerial cinematography. The beauty of drones is it allows us to capture photo and video from a new perspective. 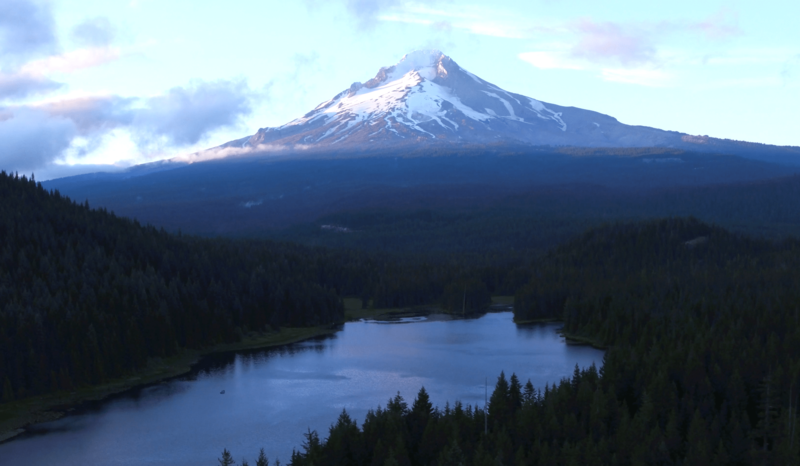 This photo was taken at Trillium Lake in Mt Hood National Forest Oregon with a DJI Inspire Drone. One of our passions is to travel to scenic areas and capture amazing footage. During the filming of our video Exploring Oregon 1.0 we traveled to the Mt Hood National Forest to do some flying. Trillium Lake is one of the most popular photography locations in the State, but we wanted to give the view a different perspective. Like ground photography, the best lighting usually comes during “golden hour” which is the 30 minutes after sunrise and the 30 minutes before sunset. This gives your final product a “magically” feel that really sets it apart from daytime filming.